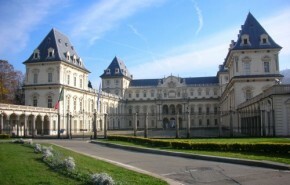 The Regio Politecnico di Torino (Royal Turin Polytechnic) was founded in 1906, but its origins go back further. It was preceded by the Scuola di Applicazione per gli Ingegneri (Technical School for Engineers) founded in 1859. Currently, the Politecnico has 29.300 students studying on 96 courses (22 Bachelor’s degree courses; 31 Master of Science courses; 23 Doctorates and 20 specialisation courses), 18 of which – mainly Masters programmes are held in English. The college has a staff of over 900 lecturers and researchers, and around 875 administration staff who serve 5 Schools, 1 Graduate School, 18 Departments and 7 Interdepartmental Centres. Situated on the plains of Northern Italy, at the foot of the Alps, Turin has a long and influential history. The home of Ferrari and Juventus, the city is at the heart of Italian industry. With a large student population, Turin is a lively city boasting a rich cultural life and a young restless nightlife. Next to the Po River, the Murazzi is the perfect area to have the evening’s first drink while the sun colours Turin orange. In the Murazzi bars Turineses, expats and students meet in the cafes before moving deeper into the night.